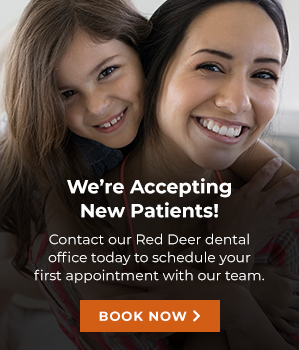 At Southpointe Dental in Red Deer, Alberta we offer cosmetic dental services such as teeth whitening, inlays and onlays, dental implant restorations and more. Dental bonding treatments can repair damaged or misshaped teeth on your smile. Dental implant and implant restoration are options we provide to replace missing teeth. Full mouth restorations can correct several cosmetic dental problems for a fulsome solution. Inlays & onlays are dental restorations that offer strength, support, and protection to your teeth. We offer two types of whitening: in-office and at-home to ensure you get professional results. Porcelain veneers to help replace broken or chipped teeth and enhance your smile.